"The Norwegian Nobel Committee has decided that the Nobel Peace Prize for 2009 is to be awarded to President Barack Obama for his extraordinary efforts to strengthen international diplomacy and cooperation between peoples." Atleast he's in good company with the likes of Al Gore, Yasser Arafat, Alva Myrdal et.al. Nobel Committee Chairman Thorbjoern Jagland said, "We hope this can contribute a little bit to enhance what he is trying to do." That's more honest than I'd expected they would be about the decision -- it's just a partisan decision because they endorse socialism, not unlike when Gore won the same award. They might consider changing the name of the award to "most Googled Democrat." Another dynamite decision by the Nobel Committee. Darn, Red, you beat me to it but you did forget Jimmy Carter! This is unbelievable. I mean, that the Nobel committee selects the wrong people for the wrong actions is a given, but now they're just selecting people for ... talk...? Considering that the nominations were finallized in the beginnng of February, this selection is based upon 10 days or so of a President being in office. WOW is about all that can be said. This says alot about the rest of the people in the world who must have done in their lifetimes even less than Obama did in 10 days. Newser just RT'd my Nobel award tweet: "Give me a gold medal and I'll run the marathon tomorrow." ROFL! They might consider changing the name of the award to "most Googled Democrat." Just heard the news, and like others, wasn't sure if it was April 1 -- or Halloween. Many were shocked by the unexpected choice so early in a presidency that began less than two weeks before the Feb. 1 nomination deadline for the prize and has yet to yield concrete achievements in peacemaking. Republican Party Chairman Michael Steele said Obama won because of his "star power" rather than meaningful accomplishments. He won because much of the world shares his hatred of America, his desire to see America stripped of its greatness and shackled down to the level of any stinking 3rd-world dictatorship. Either that, or his ACORN buddies were involved in the voting. No other way to explain it. Now the Marxist Messiah is one more piece of feces, floating in the inhuman sewer that includes such "dignitaries" as Yassar Arafat and Al Gore. But shouldn't the Nobel committee give special recognition to those who launched the Messiah on his rise to stardom--his blood brothers in the Weather Underground: Bill Ayers, Bernadine Dohrn, Mark Rudd, etc? No word yet on what the victims of those they murdered have to say about this. Also no word yet from those who award Emmys, Grammies, etc. -- no doubt those awards will soon follow. Oh, and Jimmy ("I never met a terrorist or anti-American dictator I didn't like") Carter is another piece of you-know-what floating in the same sewer. Obama also awarded Nobel prize in chemistry. “He’s just got great chemistry,” says Nobel Committee. Update: Even media Obamaphiles can’t believe it. Check out the Financial Times — “It is hard to point to a single place where Obama’s efforts have actually brought about peace” — or the Times of London, declaring that the committee’s made a mockery of the award. "Rarely has an award had such an obvious political and partisan intent. It was clearly seen by the Norwegian Nobel committee as a way of expressing European gratitude for an end to the Bush Administration, approval for the election of America’s first black president and hope that Washington will honour its promise to re-engage with the world. "Mr Obama becomes the third sitting US President to receive the prize. The committee said today that he had “captured the world’s attention”. It is certainly true that his energy and aspirations have dazzled many of his supporters. Sadly, it seems they have so bedazzled the Norwegians that they can no longer separate hopes from achievement. The achievements of all previous winners have been diminished. Erik Erickson at RedState quips: He’s Becoming Jimmy Carter Faster Than Jimmy Carter Did. Michael P. Leahy asks: Where’s Kanye West when you need him? Perhaps the Messiah's worshippers will next give him an Olympic Gold Medal -- though first they'll have to create a new category, bull-slinging. Redstate.com CEO Erick Erickson gets right down into the gutter. I did not realize the Nobel Peace Prize had an affirmative action quota for it, but that is the only thing I can think of for this news. There is no way Barack Obama earned it in the nominations period. That’s the good news. Also, I think if we survive the next four years, we can forget the whole experiment of voting in the inexperienced, but smooth operating, hip black guy thing, from happening again for a while. I picked the wrong day … to stop smoking and drinking. Surprisingly honest indeed. Like the rest of europe they're just fawning over Obama like some mindless teenage girls. On the other hand, I think 'talk' is how leftists define peace. "Many believe that he still has not earned the right to receive such a distinction," Castro wrote in a column published in state media. "But we would like to see, more than a prize for the U.S. president, a criticism of the genocidal policies that have been followed by more than a few presidents of that country." On good days it has occurred to me more than once we may be witnessing the Bonfire of the Progressive Intellectuals. All over the world they are so far ahead of any actual achievement; it's possible the elevation of Obama is the absolute zenith of their achievements and the only direction for them is down. A wise secular/amateur philosopher once wrote: It is better to travel hopefully than to arrive. I am, however, encouraged some days by their overreaching and swaggering arrogance. Having recommended a Catholic sponsored program above - to the consternation of some - let me couch a difficulty with the Church in their terms. While being raised a Catholic, the three cardinal virtues of faith, hope and love were constantly stressed. I think it significant that they really don't discuss hope anymore. And I'll bet that's how these "intellectuals" "think". They see everyone out here -- those not in their little enclaves -- as ignorant peasants not able to grasp their powerful insights as to how the world really works. And they do stay to themselves in little enclaves, supporting one another in their small minded and arrogant falsehoods. David Horowitz has pointed this out. But, I think in the battle of ideas we are getting close to the heart of the beast, and we should now be close to killing that dark center of pure villainy. Their foolishness is born of ignorance and deliberate narrow mindedness (political correctness promotes narrow mindedness). Funny how so many of these modern intellectuals are as close minded than the ignorant masses who believed in things like witch burning, but that is who we are dealing with, and the reason we have nothing to fear from them. 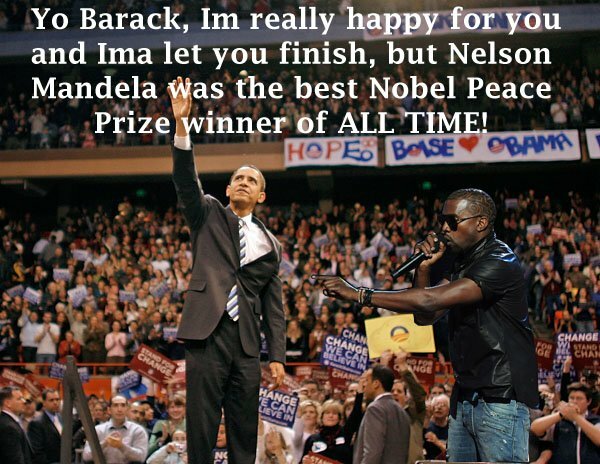 Btw, I think the Nobel Peace Prize should be dubbed the Nobel Peace Riddle. They announce the winner, and we have to figure out how it all makes sense. Thanks Paul, great link. The initial commentary was especially eloquent. I'd really like cancer and muscular dystrophy and influenza and zits to disappear from this Earth. I think they're really really bad. I'm even willing to meet with them in a multilateral negotiation to make them stop their attacks on the free people of this Earth, Man and Woman, Black and White, Rich and Poor, Mother and Child, Peaches and Herb...! I think I'm looking pretty good for the Nobel Prize in Medicine, waddaya think? I'd vote for you, but first you have to demonstrate that you are liberal and will not take crap from Fox News. Dr. Hurd quotes the comment that it's like someone winning Employee of the Month, his first week on the job. When it comes to Barack Obama, there are two kinds of people. One still believes he walks on water, the other knows he's just a talented politician. Yet there's no sense cursing them, for they inadvertently have provided a valuable service: Their award signifies the high-water mark of Obama-mania. The prize is so preposterous, it can only hasten the awakening of others to his inflated stature. Like an investor who buys into a bubble just before it bursts, the panel's declaration that Obama has done more for peace than anyone on the planet does not stand even half-serious scrutiny. The instant result is a simultaneous diminishing of both the prize and the man. Arriving when half of America disapproves of Obama's performance as president and others are having buyer's remorse, the prize smacks of a desperate bid to prop him up. Because it comes from lefty foreigners who look with contempt on values most Americans cherish, the award serves to further distance Obama from his nation's political heartland. All downhill from now on for the Marxist Messiah, blood-brother to the Weather Underground? As Shakespeare would say, "a consummation devoutly to be wished." The only point I would disagree with is that it is "a desperate bid to prop him up." It is a repudiation of Bush: Carter, Gore got Nobel Peace prizes during his admin. and now Obama gets it immediately after Bush leaves.